Room for error is limited when producing a luxury vehicle. A lot of time and thought must go into it since you’re competing with the likes of Mercedes-Benz, Audi and Lexus, but Mazda did it with the 2018 Mazda CX-9. This new, full-size SUV has a lot to offer in it, so we invite you to come check it out here at Hall Mazda in Brookfield! Each Mazda CX-9 model brings with it plenty of reasons to be excited. As a seven-seater, it ensures that larger families can travel around in style. Despite being a larger SUV, it still manages to get a cool 28 hwy mpg, so you won’t be stopping nearly as much as you would be in other SUVs. Let’s take a look at some of the specs and features below. Let passerby know that you mean business. Driving through town in a Mazda CX-9 is sure to grab a few looks, due to its athletic stance and elongated hood. Combine that with the tapered roofline and LED headlights and you’ve got a sophisticated-looking SUV that is sure to strike attention and respect. Built to perform, and made to go the extra mile. This isn’t your traditional SUV. The Mazda CX-9 has smart features such as predictive i-ACTIV AWD® which monitors outdoor temperatures, throttle input and braking patterns and uses that information to adjust power delivery accordingly. This will give you the best traction possible. Mazda continually makes it easy to feel connected with the road without having to sacrifice comfort. That can be seen with SKYACTIV®-VEHICLE DYNAMICS with G-Vectoring Control, which optimizes load control to help you steer better. You might not notice it in the moment, but then again that’s how the feature is designed. As you can see, the 2018 Mazda CX-9 is equipped to handle almost any situation you might encounter. 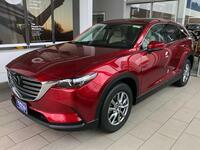 To learn more about this SUV, get in touch with the team here at Hall Mazda in Brookfield!